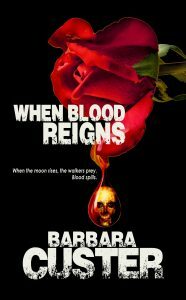 I started reading When Blood Reigns right after I finished watching Van Helsing, a tv series about a zombie apocalypse with vampires instead of zombies. Both put me in the same mindset: slightly spooked, slightly paranoid, afraid a zombie might turn up any moment, feeling like I couldn’t trust a single of the characters besides the main character, and that not all survivors might have the best of intentions. Alexis is an intriguing protagonist, and I particularly liked how she grew and changed throughout the book. The author’s combination of a zombie apocalypse with aliens and science-fiction elements is a huge bonus too. The Kryszka, as the aliens are called in this book, have a hand in the zombie apocalype now infesting earth, and that’s an unique spin. I don’t want to give anymore away about the relationships between the main cast, the zombeies, and the Kryszka, but it’s very compelling and entertaining. As with all apocalypse survivor stories, you get a sense of hopelessness. Not only is the world getting destroyed, there’s also no one left to trust. Good guys turn into bad guys. People who should rely on each other, betray each other. The writing is solid, and once I started reading, I kept turning page after page, curious to find out what would happen next to these characters. Not for the faint of heart (it is horror, after all) but definitely an enjoyable, suspenseful read for fans of horror and scifi.